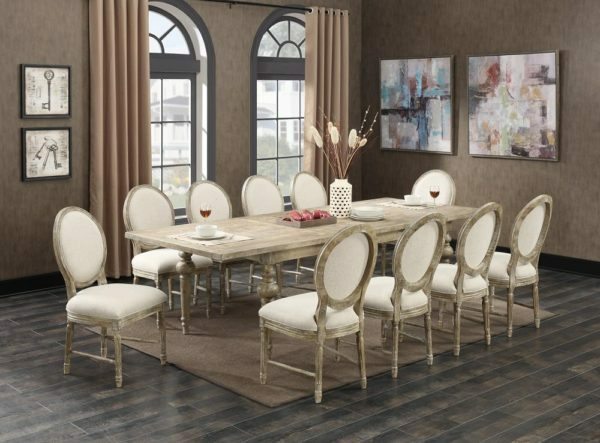 Interlude combines the rustic nature of reclaimed woods with classic oval back side chairs to create an eclectic collection for today. Pine veneers and solids and American White Ash solids are brought together in a beautiful Weathered Pine finish. The collection includes dining height as well as gathering height pieces. The dining table features a butterfly leaf with cable driven slide system for easy one-hand operation. A matching server with four drawers and two louvered doors complete this presentation. Pine veneers are crafted with reclaimed pine solids and American Ash solids and then hand-distressed adding a rustic country flair to this classic design. Cup pulls and exposed hand-latch rods add just the right touch of authenticity to this collection.